Estimated at several hundred people during the period of first official contacts (at the end of the 1970s), the Matis, speakers of a Pano language, numbered no more than 87 in 1983. In this interim, various epidemics were introduced, including by a Funai team that proved unable to contain them. The final months of 1981 were especially tragic, costing the lives of around fifty of the Matis and prompting many survivors, traumatized, to abandon their dispersed occupation of the forest to regroup next to the Funai post on the shores of the Ituí river, ensuring their ready access to medicines. Some years later, the swiddens had begun to produce normally, there was always meat available, some rituals had resurfaced and there was a significant population growth. However, the demographic and psychological shock arising from the badly undertaken and unnecessarily lethal contact persisted. Today the Matis no longer live in a single village and have returned, albeit timidly, to the former pattern of territorial occupation. The term matis was the name that non-Indians – in particular, the Funai employees – gave to the group calling themselves matses. However, it is important to note that matses is also the self-denomination of another people, culturally and linguistically very close to the Matis: the Matses (also known as the Mayoruna). The Matis accepted the name matis to a certain extent, since it forms a variation of matses, though there are other names widely used at local level (see below). The word matis, as well as being an ethnonym – that is, the name attributed to an ethnic group – also means in a wider sense ‘human being’ or ‘person.’ The term may also be used to refer to an individual's set of kin. As this term can have different meanings depending on the context in which it is used, distinctions between the matis – the ‘humans’ – need to be established. These may be produced by using words, such as kimo and utsi, that create new nuances. The Matis differentiate the matis kimo from the matis utsi. The first are the humans to whom one is closest, with whom one has a strong social bond: they are ‘real people’. The term matis utsi, meanwhile, can be translated as ‘other people’. The Matis possess two other self-denominations: mushabo and deshan mikitbo. The first alludes to the sharing of the same tattoo by all members of a community. Mushabo literally means ‘the tattooed ones’ (musha = tattoo, -bo = plural). Even though, in their Pano cultural area, the similarity between facial tattoos is not necessarily a mark of ethnic identity, this seems to be the role they have come to perform in recent years. Irrespective of their origins, the Matis say that they are all mushabo, a term that can sometimes be exchanged for wanibo, ‘people of the peach palm’. The name deshan mikitbo, on the other hand, simply means ‘upriver people’ (i.e. those living further upriver). The Matis usually employ this expression to differentiate themselves from the Korubo, whose territory is situated downriver. ‘Being upriver’, as a mark of identification, is defined in terms of the course of the Ituí river (or the Coari river) and from the viewpoint of a contrast with the main traditional adversaries of the Matis. The Matis language belongs to the Pano linguistic family. Only the maternal language is used in day-to-day village life. However, almost all males between 17 and 35 years old know how to speak some Portuguese, enables them to buy and sell produce during their trips to urban areas. Some women also manage to communicate in Portuguese. Additionally, many men and some women also speak and understand the language spoken by the Marubo, also from the Pano family. The latter helped Funai to establish the first official contacts with the Matis in 1976. In general, the Matis understand the languages of the Kulina, the Matses (also known as the Mayoruna) and the Korubo. The area occupied by the Matis forms a strip extending from the middle Ituí river, passing through the upper Coari (a right shore affluent of the Ituí) to the middle Branco river (a left shore affluent of the Itacoaí). This area is situated within the borders of the Vale do Javari Indigenous Territory. The Vale do Javari IT covers 8,544,480 hectares. It comprises the second largest indigenous area in Brazil and is located in the upper Solimões (Amazon) region, in the southwest of the state of Amazonas, close to the border with Peru. This area was officially recognized as an Indigenous Territory in 1999, physically demarcated in 2000 and ratified in May 2001. It covers areas drained by the Javari, Curuçá , Ituí, Itacoaí and Quixito rivers, as well as the upper courses of the Jutaí and Jandiatuba rivers, and overlaps the Brazilian municipalities of Atalaia do Norte, Benjamin Constant, São Paulo de Olivença and Jutaí. Other peoples live in this territory along with the Matis, including the Kanamari and Tsohom Djapá (speakers of Katukina languages), the Marubo and Matsés (Mayoruna), and the Kulina and Korubo (whose languages belong to the Pano family). There are also about eight isolated indigenous groups in the area (see Isolated Indians). Based on the most recent surveys carried out by various institutions working in the region, the area’s total population comprises about 4,065 Indians, taking into account only the contacted groups. If we include the best estimates for the isolated groups with a confirmed presence, this number may increase by a few hundred people. The indigenous peoples of the Vale do Javari share many sociocultural traits, but also possess some significant differences from each other. Reports of the existence of uncontacted indigenous groups in the area between the Ituí and Itacoaí rivers first surfaced with the installation of Funai’s regional office in the Upper Solimões in 1971 in the town of Benjamin Constant. This office was intended to support the work involved in constructing the Perimetral Norte highway linking the town to Cruzeiro do Sul in Acre state. The Ajudância do Alto Solimões (Ajusol) was set up with the aim of attracting and assisting the Indians of the Javari whose territories would be traversed by the highway (Campanha Javari, 1986; CEDI, 1981). No documents prior to 1970 mention the Matis and even in 1972 they were still confused with the Marubo by Funai´s staff. It was only after this point that these government employees and the region’s non-indigenous population began to recognize the Matis as a group with their own cultural characteristics. Thus, in 1974, pursuing Funai’s remit to contact the region’s indigenous groups, the Ituí Indigenous Attraction Post (IAP) was founded on the left bank of the Ituí river, above the mouth of the Novo de Cima river (CEDI, 1981). Information concerning the period of the first contacts with the Matis varies somewhat. According to the Campanha Javari (1986), first contact took place on the 25th August 1975 with a woman and nursing child in a small shelter on the Aurélio creek. According to CEDI (1981), the date was the 21st December 1976. The fact is that after this period the Matis began to undertake a series of visits to the Ituí IAP to obtain machetes, axes, dogs, chickens and so on. In 1977, the Indians caught their first cold virus from the Post staff, but according to Funai’s official reports nobody died. 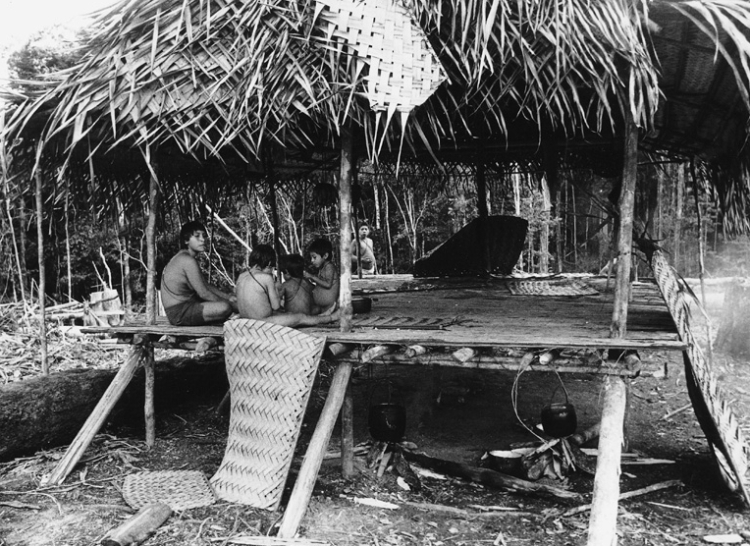 In 1978, Funai employees visited the Matis malocas, spending several days among them. From then on, the contacts became more frequent. The demographic estimates for the Matis population during the contact period also vary considerably. A nursing assistant at the time claimed there were 150 people. According to a former Funai employee, some 300 people were estimated based on the size of the malocas and the number of family spaces inside them. 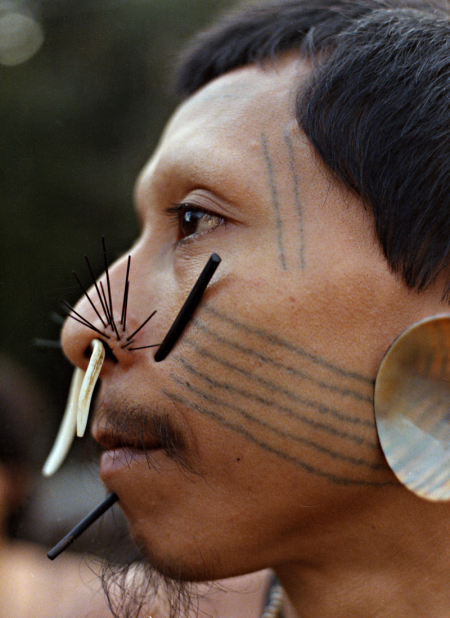 A pastor from the Brazilian New Tribes Mission, meanwhile, believed there were more than a thousand Matis, an estimate made after spotting 12 malocas during a flight over an area that he considered to be Matis (Campanha Javari, 1986). The Matis say that there were many of them before Funai arrived and that many died during a fever epidemic, though there are no exact estimates (Campanha Javari, 1986). They traditionally lived in family groups inhabiting five malocas located at some distance from each other with a variable population spread across their occupied territory (CEDI, 1981). These malocas were located on the Coari river, the Branco river, the Boeiro creek, the Jacurapá creek and between the Jacurapá and Boeiro creeks. The presence of loggers and rubber-tappers in poor health and without medical aid close to the recently-contacted Matis, combined with the failure of the Post’s staff to observe proper precautions, led to the contamination of the Matis early on. From 1978 onwards there were epidemics of cold viruses, coughing, dysentery and so on. To complete this tragic scenario, the Post lacked medicines to help them or petrol to transport the more seriously ill, which soon lead to the first deaths among the population (Melatti, 1980). Around 11 deaths were reported to have resulted from various sicknesses from 1976 to 1980. However, between June 1981 and June 1982, around 48 Matis died from two flu epidemics (with symptoms quickly transforming into pneumonia). During this period, an enormous generation of orphans were created. A survey recently conducted by the teacher Tëpi Wassa Matis together with his father Txema Matis, during one of the activities for the teacher training course promoted by the Centro de Trabalho Indigenista (CTI), listed the names of 51 people who died in the 1981 epidemics. In 1983, the Matis population fell from 135 to 87 people – with the death of 35% of their population (Porantim, 1982; Melatti, 1983; Campanha Javari, 1986). Children and older people were the most affected. Few elder people survived. In 1985, three years after these epidemics, a population census conducted by the Campanha Javari revealed that just seven people were more than 40 years old (Campanha Javari, 1986). In February 1982, the heads of the Ituí Indigenous Post (IP) and the Marubo IP reported an invasion by loggers deep into Matis territory on the Branco river. These invaders may well have been the people responsible for the flu epidemics in the region (Melatti, 1983). Due to the high number of deaths among each family group, the Matis had to restructure their population, adapting their marriage rules and the social and political relations among the different groups. As a result, the survivors basically formed two groups that have remained intact until today (Campanha Javari, 1986; Erikson, 1992). Asked about his group’s region of origin, Binã, an elder man, stated that they had once lived between the Curuçá and Ituí rivers, but did not know when they crossed to the right shore (CEDI, 1981). The survivors of the epidemic did not remember, all the older people had died and their memories only reached back to the period when they were already living in the area formed by the Ituí, Itacoaí and Branco rivers (Campanha Javari, 1986). According to information from a former Funai employee, the area once occupied by the Matis was located between the headwaters of the São Bento, Aurélio, Jacurapá and Coari creeks. After contact, the Matis began to forge relations with the Marubo who acted as ‘interpreters,’ since they also spoke a Pano language. Various Marubo families journeyed downriver from the upper Ituí and settled at the Ituí IAP located on the middle course of the river, attracted by the presence of Funai. This led to growing contact between the peoples and an intensification of the effects of these exchanges between the recently contacted Matis and the Marubo with more than a century of contact with surrounding national society (Campanha Javari, 1986). In 1982, in an attempt to resolve the problems caused by non-Indians and the Marubo, Funai deciding to transfer the remaining Matis and the post installations to the Boeiro creek where the population divided into two malocas (Melatti, 1983; Campanha Javari, 1986). On the Boeiro creek, the Matis went through a period of extreme food shortage due to the absence of swiddens, which led them to steal crops from the non-indigenous riverine population and from the Marubo at the former post site. At the new location it was also difficult to obtain curare, the poison used on the blowgun darts, and tatchi, a traditional infusion of great spiritual importance. The process of sedentarization and concentration of the population at a single location reduced the group's mobility and generated conflicts among the groups (Campanha Javari, 1986). In 1987, the Matis moved to an area close to the Novo river and, in 1993, settled on the left bank of the Ituí, upriver from the Jacurapá creek (Campanha Javari). By 1998, feeling surrounded by the Marubo of the upper Ituí upriver and the Marubo of the former Ituí IP at the mouth of the Novo de Cima river – a situation compounded by the lack of some important resources – the Matis built a new village downriver on the Aurélio creek. Many still live at this site, distributed in three large malocas at the mouth of the creek. In 2005, twenty-four years after the traumatic epidemics, the family groups began to organize itself according to their traditional pattern. One group left Aurélio village to form a new settlement, Beija Flor village, forty-five kilometres from the former. With the population growing, ritual practices abandoned after the death of elders and shamans, the principal bearers of traditional knowledge, were revived (Erikson, 1991). In 1986, for example, the Matis revived the most important ceremony, the tattoo rite. That year, twenty-six youths agreed to be tattooed and just two refused, demonstrating the revival of interest in traditional practices. This example contrasts with the group’s previous resignation when, in 1995, they said that tattooing had disappeared due to the proximity of non-Indians and the death of the elders, the ritual being deemed full of supernatural dangers that only the latter knew how to deal with. At some point between 1993 and 1998, another tattoo ritual was held, likewise in 2002. This was a surprise for all those who knew the Matis closely since the assumption was that this rite had been completely abandoned, specifically because of the shame that the younger people felt in appearing before non-Indians with their face tattooed – an irrefutable mark of their ethnic identity. Hunting with the bow, blowgun and rifle is the most highly valued male activity among the Matis (Erikson, 1987). The animals hunted include collared and white-lipped peccaries, tapirs, sloths, spider monkeys (known in the region as ‘macaco preto’, black monkey), woolly monkeys, dusky titi monkeys, white-lipped tamarins, saki monkeys and caymans. We can also add macaws, curassows, guans, red-throated piping-guans and tinamous. Animals are hunted at salt licks; traps are also used. Blowguns are preferred to kill monkeys. 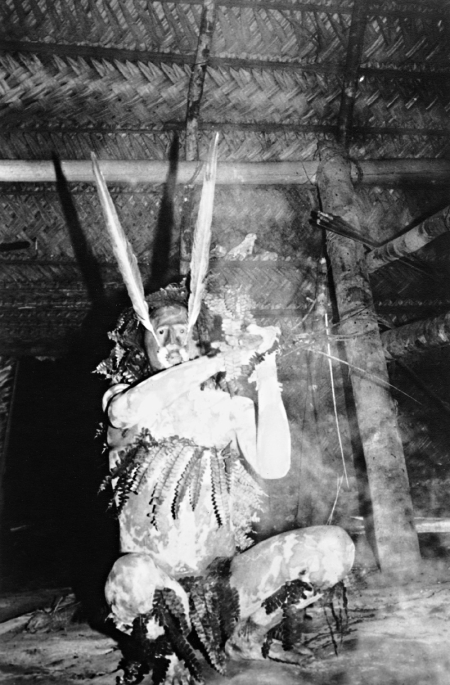 The poison used for the blowgun dart, curare, is prepared from a vine extract (Melatti, 1981). Agriculture among the Matis involves cultivation of crops on shifting areas of cleared and burnt forest (slash-and-burn agriculture). These swiddens are cleared, burnt, cultivated and gradually abandoned as yields diminish. It is important to emphasize that these ‘fields’ are not permanent: each swidden is planted just once. However, as each swidden comprises various crops, the harvest extends for various years in each part of the cultivated area (Erikson, 1987). The staple products of these swiddens are manioc, banana, peach palm and maize; consumption of the latter crop is essentially ritual (Melatti, 1981). The main fish caught are acará (cichlid), piau (leporinus), cascarudo catfish, tiger fish and the electric eel (the favourite among women). Also caught are piranha, matipiri, branquinha, curumatã (Prochilodus sp. ), pacu (Metynnis sp.) and pirarucu (Arapaima sp.). River turtles and their eggs are also eaten (Melatti, 1981). The main gathered products are patauá palm, moriche palm, puna (a fruit), cacau and cupuaçu (Melatti, 1981). The Matis subdivide all beings into two generic categories, the ayakobo and the tsasibo. This suggests the kind of dualist system frequently found among South American indigenous societies (Crocker, 1977). But in contrast to what is usually observed in these dualist societies, one of the categories (tsasibo) seems to have practically ‘phagocytized’ (annulled) the other (ayakobo). Rather than members of the society sharing the two classes in relatively equal portions, almost everyone today claims the tsasibo, devalorizing the ayakobo who are seen as inferior and ridiculous beings and subjected to constant humiliation. At first sight, it could be thought that all the Matis are tsasibo, while the neighbouring populations (Marubo and Korubo, in particular) are, for them, ayakobo. However it quickly becomes apparent that some of the members of the Matis group, even though reluctant to admit it, are linked to the ayakobo pole because of their foreign origins (they are descendents of war captives). Two of the more evidently ayakobo men have the surname nawan baku (‘son of a foreigner’), while a third is called marubo, the name of a neighbouring ethnic group. These people are all remote descendents of women captured from neighbouring indigenous groups. However, these abductions seem to have happened in fairly remote past since apparently no conflict has occurred in more than half a century. Despite their genealogical connection with outsiders, ‘our ayakobo’ or ‘inner foreigners’ have virtually no relations with other indigenous groups in the region. Just as even the closest people may be symbolically relegated to the outside, the Matis also include in the tsasibo category certain neighbouring groups with whom they have no permanent relationship – they are the ‘outside tsasibo’. 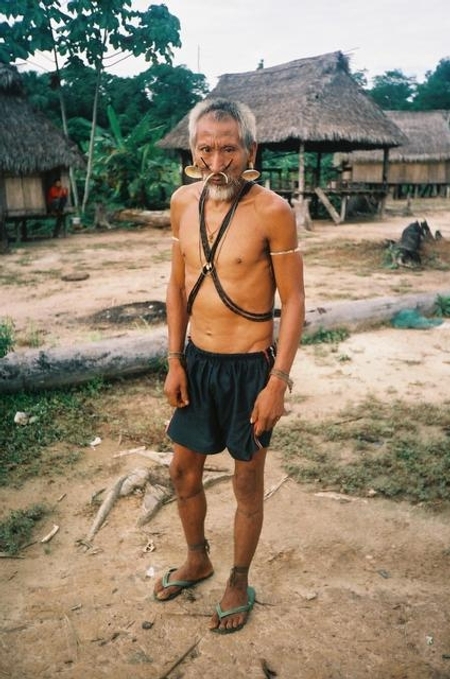 They simply recall that the elders taught: some groups (for example, the Maya or uncontacted groups on the Quixito river) are tsasibo, while others (the Marubo and the Korubo, the most frequently cited) are undeniably ayakobo. Like its inhabitants (the deshan mikitbo, ‘upriver people’), the communal house must be built to face upriver. The traditional Matis house, rectangular in shape, possesses two roofs called deshan, that is, two ‘noses’, one at each end. In the ideal model, the shobo faces upriver along with one of its roofs, which therefore receives the name ‘true nose’, deshan kimo. Although nobody would dream of constructing a house to face the wrong direction, there is always a possibility for transgressing the order established by the course of the rivers. Indeed, though hammocks are ideally placed facing the current, there is a risk of sleeping on a diagonal and suffering the same disastrous consequences of bathing while facing downstream: children in the womb run the risk of turning against the course of their own uterine life and being born ‘seated’ (breech births are highly feared by women since even if the mother survives, there is a risk that the baby will have to live with the consequences of a traumatic birth for the rest of its life). Both when bathing and sleeping in a hammock, the proper course of the world, or society, therefore depends on the correct orientation of individuals. Belonging to the community of the deshan mikitbo demands observance of a set of restrictions. Traditionally a Matis village comprised a large communal houses, surrounded by swiddens and some more or less distant small shelters where people could stay secluded, resting from the work in the swidden or fabricating artefacts protected from the gaze of others, the rain and the sun. It would be naïve to suppose that the current spatial configuration and sociological composition of the Matis groups corresponds still to the traditional patterns. 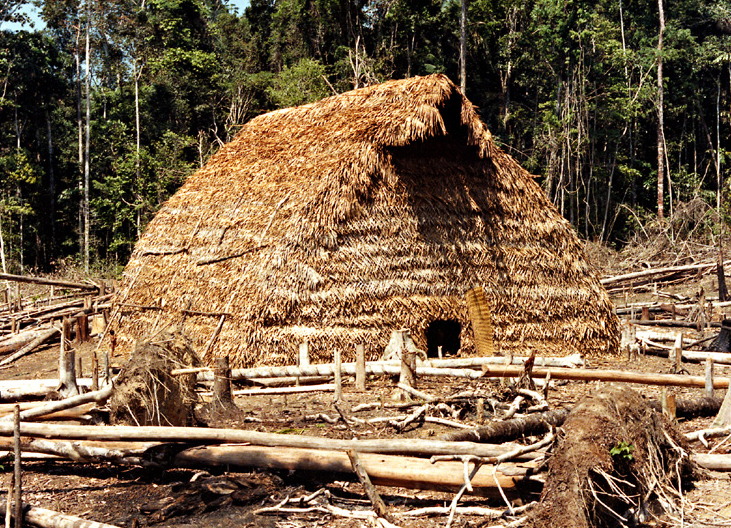 Ever since the Matis have been living in regular contact with ‘neo-Brazilians’, many things have changed, including their architecture, which acquired a new type of construction: the house built on stilts, imitating the houses of the region’s ribeirinhos (non-indigenous riverine population). These houses, very often called takpan (the name of the wood from which they are made), are generally designated nawan shobo, ‘houses of the whites’. This name translates not only the nawa origin of their style, but also their use, since these houses serve as deposits for items of non-indigenous origin. As detailed in the section on the history of contact, after a long period of everyone residing in a single village (since the start of the 1980s), the Matis reverted (from 2005 onwards) to their traditional pattern of territorial occupation in which the dispersion of family groups into different villages is central. Sho is a characteristic substance – and even a source of power – of shamans and important men. Ambivalent par excellence, this substance presents both positive and negative aspects. In beneficial form, it is transmitted formally during rituals or ‘by contagion’ when someone lies in another person’s hammock, for example. Likewise, pathogenic sho can also be voluntarily sent (via tiny blowgun darts), or involuntarily, through exhalation, for instance. The Matis can therefore impute sicknesses to the whites without really blaming them and seeking revenge. Closely linked to the taste system, sho appears in two basic forms: bata sho (sweet) and common sho, which is bitter (chimu). The sweet form, essentially female, protects while the male bitter form is dangerous. People say that being ill or suffering is literally ‘to become bitter’, chimwek. 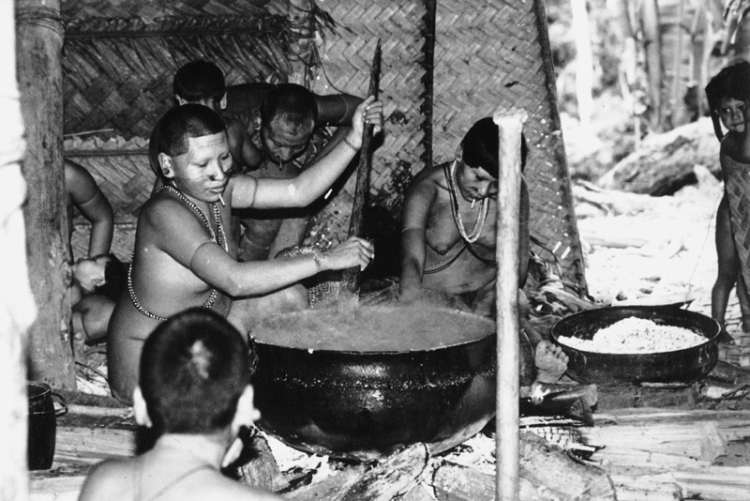 The ‘whites’ (nawa), who consume a lot of salt (a bata food), but also a lot of pepper corns (a chimu food), are renowned for their high content of common sho (chimu) – explaining the epidemics for which they are known to be responsible – and, especially, bata sho – explaining their relative ‘immunity’ to illnesses. 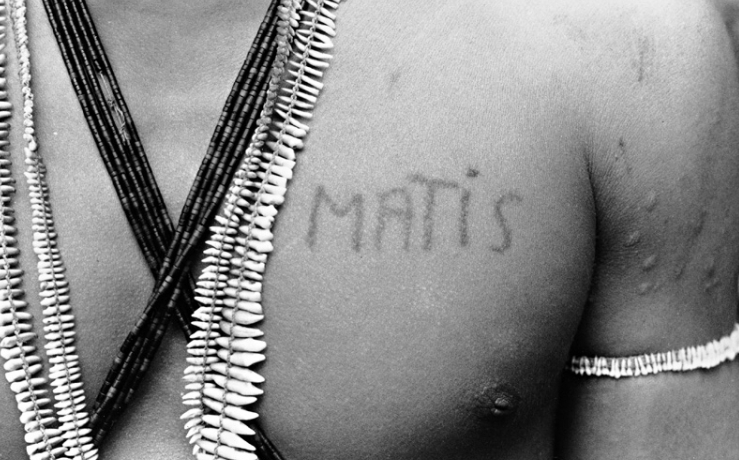 The Matis are unable to achieve the same balance between bata and chimu as the ‘whites’, favouring the latter. 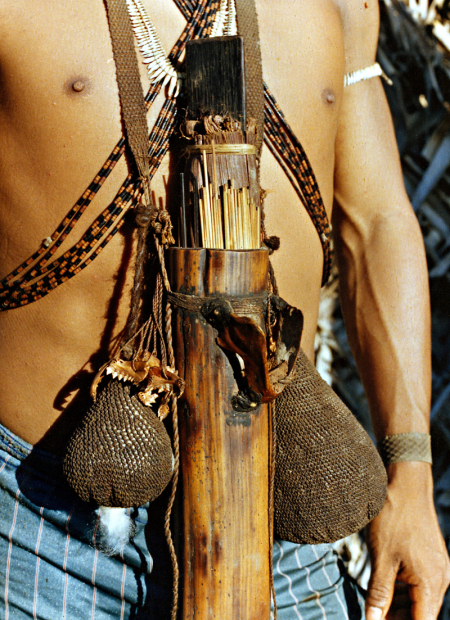 To improve their hunting prowess and, in particular, increase their skill with blowguns, men traditionally avoided any bata food (sweet foods such as papaya, pineapple, sugarcane), keeping to a diet and a pace of life governed by chimu. The latter is a polysemic term which as well as meaning bitter signifies pain, sharpness and other highly valorized qualities whose excess, though, provokes suffering and death. Hunters ingested various types of bitter or acidic substances (raw pepper, infusions made from bitter vines, pësho curare poison, various unidentified plants), injected kampo, an emetic toad venom, under their skin, introduced a liquid irritant (buchete) under their eyelids, and lashed each other: in sum, they stimulated the picante and the bitter – the chimu. Their sho content was at a maximum, which made them proud and was held to make them better hunters, but, at the same time, more exposed to diseases. When Tumi, the Matis man considered to have the most true (chimu, ‘bitter’) sho, went to the city to treat a benign infection, many people thought he was doomed, averring that he would not survive the excess of nawan sho (‘sho of the whites’, too sweet/salty). His mother wept in mourning for him. Protected by a bata diet, by contrast, women are considered to be less at risk from the whites, which may explain their dominant role in the initial contacts, very often placing themselves to the fore and initiating the dialogue (CEDI, 1981: 85). Overall, Matis symbolism clearly assimilates female bata and foreign bata and opposes these terms to chimu as male, endogenous and internal (Erikson, 1990). Since the demographic catastrophe that struck at the start of the 1980s, the Matis attitude towards sho has perhaps changed. They decided of common accord to veto and abandon most of the practices designed to obtain sho, since everyone thought that it was too dangerous to maintain them. Although central to Matis ceremonial and ritual life, certain painful (chimu) practices had to be abandoned since it was perceived that they could make young people too vulnerable to sicknesses and death (Erikson, 1987). Malagueta peppers were no longer planted in the swiddens and the use of buchete eyewashes was abandoned. Rituals in which the ancestors whipped children or in which adolescents were tattooed also fell into disuse. The number of adornments pierced through the skin (lip and nose spines), also vectors of sho, were reduced as though demonstrating that their wearers were no longer capable of withstanding many of them. Everything relating to sho can turn against people, meaning that when misfortune strikes, people turn against sho and the substances through which it is obtained. The generation prior to contact had already abandoned tobacco (ampushute) and hallucinogenics (kawaro). After the tragedy provoked by the epidemics, it also became necessary to moderate the consumption of bitter products designed to increase hunting success. The substance whose absence was most felt was undoubtedly tachik, a vine from which a stimulating drink was obtained. Formerly, the Matis looked to isolate themselves to remain healthy and sought contact with the 'whites' to obtain bitter sho (tachik vines and chimu tools) and, at the same time, avoided bata sho (which they risked contracting during such expeditions). Currently they remain healthy at the expense of their isolation, accepting on the contrary to live close to Funai and its supply of medicines. It was clearly the fear of death and not the desire to simplify life that forced sho to be abandoned. However, the brutal disappearance of the older Matis – who would have been able to encourage young people to submit to the rules needed to acquire sho – undoubtedly tipped the balance in favour of this new situation. Some adolescents now assert that the older people knew nothing, claiming that sugar and salt (bata foods) are blessings and that today, fortunately, snake bits are not as chimu as they once were. In compensation, some young adults display considerable nostalgia for the past, yearning for a period when, they say, one could hunt all day and dance all night with becoming the least bit tired; a period in which, thanks to sho, hunt game was not as rare as it is now (the current scarcity of game – undeniably evident since sedentarization – is still relative). Although an excess of sho is still invoked when the subject of the epidemics arises, today people also mention another factor: the smell of the dynamite used during the period by fishermen, which, among other harmful effects, caused the death of all the sloths in the surrounding area. Generally speaking, we can observe that sho is less feared than before. Today kampo injections have become a recurrent practice once more. Likewise, while at the end of the 1980s people denied that anyone had sho, today they admit that some men have sho and may even, if they so wish, use it to harm others. Some hunters also readily store pots of curare hunt poison. The growth of the Matis population is apparently being accompanied by the people recouping their self-confidence to some extent. Omnipresent in adult discourses towards children, the mariwin are generic (impersonal) ancestors whose role involves hitting children in order to harden and discipline them and to make them more active and vigorous. Adults frequently arrive in the village wearing the masks representing these spirits, armed with canes, moving about, stooping and growling scarily. The children are taken to them. Unless they manage to escape, all of them are whipped from the youngest to the pre-adolescents. The blows are not applied to cause harm but to improve muscle tone. The whips of the mariwin are made from the stalks of the daratsintuk palm and each cane, broken or still intact, can only be used once. 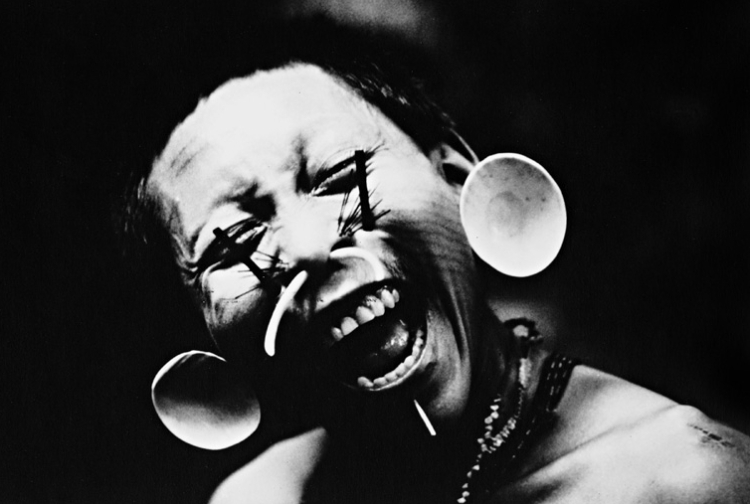 We can therefore note an individual connection between the palm and each child, suggesting that, just as the medicinal plants and the needles of the tattooist are used just once, the lashes inflicted by the mariwin have a properly therapeutic and preparatory value. Lashing speeds growth: when crops and planted vegetables become scarce, the Matis, in order to shorten the period between harvests, put on their ceremonial attire and decorations and strike the plants in their swiddens to incite their development. Children are also whipped and their gums pricked from the age of two or three. These blows anticipate what will come next, inaugurating a life marked by ‘therapeutic’ whipping and piercing, including decorative perforations, tattoos and the action of the mariwin, the central feature of the whipping rituals. There are in fact two types of mariwin, the put (‘red’, whose whole body is covered with an orange-ochre clay) and the wisu (‘black’, covered in grey earth). The red mariwin, who are seen to be closer to the living, come from distant locations where the Matis once lived: from the now abandoned swiddens that are still exploited for their peach palms, though they no longer produce plants for daily consumption such as manioc and banana. The black mariwin, for their part, come from even further away: from holes in the banks along the shores of the big rivers. These beings supposedly cause more harm to children who they are less familiar with, since they do not need to measure their blows. They are generally more distant, as the Matis often remark. Contact undoubtedly disturbed the relationship of the Matis with their ornaments. Some fell into disuse, while new elements were incorporated and began to be used as traditional adornments: that is, they were only used after a certain age. Older people complained that the young men looked like women and the nawa, non-Indians. Formerly, they said, adults used the full set of ornaments. But over recent decades, most people have abandoned using them. Nonetheless, though the ideal of ornamentation is no longer realized, the Matis have not forgotten the order in which the ornaments should be acquired and accumulated. This sequence is described below. Matis children receive their first piercing – on the ear lobe – at the age of four or five. Next a very fine stick may be inserted, the first paut (‘ear pendent’). Over the years the diameter of the wooden sticks is gradually increased until the point when a finger can be passed through the hole, meaning the sticks can be replaced by a disc called a tawa. 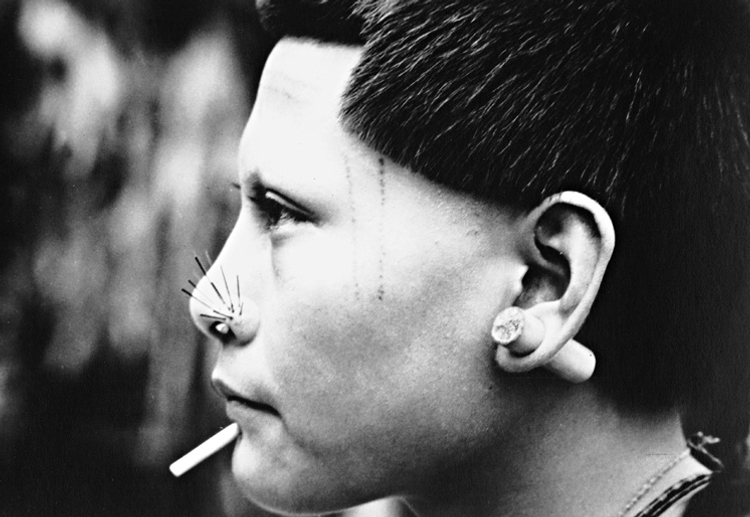 Some years after the ears are pierced, at around eight years old, the child’s nose is pierced to insert the first pair of demush (‘whiskers’, like those growing on the faces of mammals): these are fine, black needles made from palm fibre. As with the previous perforation, the process lasts for several years. The number of demush increases until the nostril is almost completely filled (a dozen in each one). The next stage involves the opening of the nasal septum to insert the pendent called detashkete. The principle of gradual enlargement continues, but as in the case of the paut (‘ear pendents’), only men reach the last stage of substituting the small sticks with the more sophisticated detashkete, an artefact made from a part of the shell of gastropod molluscs. Next, at the time of puberty, comes the moment to pierce the lower lip. Women begin to use the kwiot (‘lip decoration’) made from light-coloured wood during the period of their first sexual relations and take good care of it. Men, by contrast, pay less attention to theirs which are much smaller. The heads of family generally use a lip decoration made from black wood. Men undoubtedly attribute less importance to these adornments, since they possess another which is placed through the upper lip. This reflects the fact that, for the Matis, the lower is female and the upper male (the man’s hammock is always placed above the woman’s). Two or three years after the first kwiot – sometimes earlier, depending on the periodicity of the rituals – is the time of the first musha, or ‘tattoos’: two parallel lines over the temples and cheeks are applied during a ritual, the culminating moment of Matis ceremonial life. In the ritual, young people of both sexes are tattooed simultaneously and in identical fashion: the motif used is the same for everyone (see The Musha Ceremony). Between the ages of 16 and 20, now fully adult, men pierce their face in the area of the dimple separating the jaw and the cheeks. This then allows them to insert the mananukit, relatively thick and long sticks made from a black palm. As in the case of the kwiot adornments, the number of mananukit used was much greater in the past than the present. During the second tattoo ceremony, each young man or woman is tattooed with a series of parallel lines (numbering from six to eight) on the left cheek and then the right. The number of lines designed on each cheek always differs. It can be observed that over the course of a single ritual, some youngsters are tattooed on the temples and forehead, while the oldest are submitted to the procedure on the cheeks. The Matis insist on a difference, though: the first procedure (forehead/temples) is more painful than the second (cheeks). The gradual acquisition of ornaments literally points to the stages of the individual’s maturation within a pre-established order. There is nothing surprising about this given that the Matis possess a fairly linear view of existence – which is seen as a succession of pre-ordained stages, a gradual evolution towards a highly valued old age. Here the processes of maturation and the questions of relative age are of considerable importance, since they explain that everything must come in its own time: every food and every item of knowledge is likewise hierarchized. Meats, for example, are gradually introduced into the person’s diet; a man should know how to hunt with a blowgun before hunting with a bow; a woman should know how to make a hammock before learning to make pots, and so on. Techniques and knowledge should be gradually acquired. The acquisition of ornaments forms part of the same logic. Imposed in a predetermined order, the ornaments constitute veritable age classes, giving an eminently concrete shape to the hierarchical predominance that the Matis attribute to seniority and maturity. As we have seen, the Matis also refer to themselves as mushabo, ‘tattooed people’, or as wanibo, ‘peach palm people’, undoubtedly because the spines used to tattoo must be taken from the peach palm. Notably musha also means ‘spine’ or ‘thorn’. Matis tattoos, like those of the other Pano groups, are a powerful common denominator since belonging to a community is defined precisely by the existence of facial markings. As the tattoos involve one unique graphic motif, they allow all the Matis, irrespective of their origins, to define themselves as mushabo. Since the last decades of the 20th century, the Matis have attributed a new meaning to their facial and body decorations, especially the tattoos. This emphasis is linked to the emergence of a collective ‘Matis’ identity. The reappearance of the musha ritual in 1986, after being abandoned for a period of ten years, was related to the assertion of a distinct identity opposed to that of the nawa (the non-Indians). While the ceremony for tattooing young people undoubtedly represents the central axis around which Matis ritual life is framed, from the individual viewpoint it comprises just one stage among many others in the cycle of forming the person, seen as a continuous process inscribed in a time span that extends beyond the person’s physical life. The musha ritual is typified by excess and the distribution of intense activities. The ritual may last for up to fifteen days and is always preceded by one or more weeks of festival preparations: men busy themselves smoking the meat, already divested of their usual adornments, while women produce the drink and new pots indispensable to the ceremony. During the festival, rather than appearing momentarily in isolation, the mariwin (ancestral spirits) appear en masse and throughout the ritual. At night, rather than sleeping, everyone dances inside the maloca, imitating the animals in comical fashion. While the festival lasts, everyone works day and night non-stop. One can do everything except show oneself to be chikeshek, ‘lazy’. During the entire ceremonial period, plant drugs (tachik) and physical stimulation help to maintain the pace, while resting is (theoretically) prohibited. To rid themselves of the temptation, women remove their hammocks from dawn to dusk. Rest comes later, after the culminating point of the festival: the tattooing of the adolescents (both sexes), who enter into a period of reclusion (complete isolation for five days) which gradually reduces over the years. The tattoos are applied using needles dipped in a black paste – a mixture of a resin (mamon), genipap (wisute) and a compound obtained by burning nimen and timpa leaves (unidentified plants). The process, which is said to be more painful on the temples and forehead than the cheeks, is experienced by boys and girls as a difficult and dangerous ordeal, their faces left bleeding but full of pride, since they have proven their bravery to all those present and in particular to the ancient ones, the mariwin. Although the latter are omnipresent throughout the entire ceremony, they do not participate directly in the tattooing, but through their metonymic emissaries: the peach palm spines and the mamon resin. The recently made tattoos are fairly fragile and demand precautions. After the ceremony, the initiates need to bathe to clean away the blood from the wounds and help fix the marks. They also have to stay in reclusion for the first few days after the tattooing, only being allowed to leave as a group wearing a fairly peculiar hat: for the boys, the tukuru; for the girls, the shaë. The dead person is buried in a fetal position and wrapped in a hammock in the part of the maloca where he or she slept. The surface of the grave is levelled with beaten clay. The maloca is abandoned and, after a few days, burnt. According to Paula (1969:20-21), the deceased's belongings are buried with him, the hammock placed over the head and the grave then filled in. Those objects unable to be buried with him (blowgun, bow, arrows) are later burnt. When an Indian died in Atalaia do Norte many years ago, the head of the Post was criticized for returning the deceased’s adornments to his family rather than burying them with him in the city. His belongings were burnt both at the Post and in the maloca in which he had lived. A while later the maloca next to the Post, which the Matis had built as a shelter for themselves on their visits and which the dead man had helped construct, was set alight. ERIKSON, Philippe. “Qu’est-ce qu’un ‘ethnonyme’? : L'exemple matis (Amazonas, Brésil)”. In: Cahiers Amérique Latine Histoire et Mémoire/Saint-Denis, Université de Paris 8, 2004, n° 10 [Identité: positionnements des groupes indiens en Amérique Latine], pp. 127-135. URL: http://alhim.revues.org/document112.html. Consultado em 21 de novembro/2007.